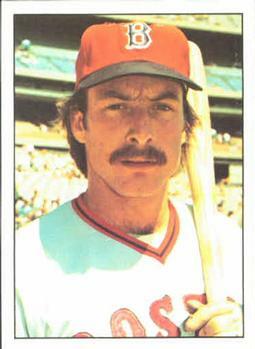 A switch-hitting reserve catcher (.228 career batting average) who came up in the Red Sox farm system, Tim Blackwell had his best season at the plate as a Chicago Cub, hitting .272 and catching full-time in 1980. Blackwell grew up in San Diego and participated in Little League baseball. A star in two sports at Crawford High School, he was voted Most Valuable Player in both baseball and football. As a senior, he batted .392 in league games, hit .355 overall, and was declared the third baseman selection for the All-League First Team and the All-San Diego California Interscholastic Federation second team. Upon high-school graduation in 1970, Blackwell attended Grossmont Community College in El Cajon, California. On June 4, 1970, the Boston Red Sox selected the infielder-catcher – properly Timothy P. Blackwell – in the 13th round of the amateur draft. Red Sox scout Ray Boone signed him. Blackwell was assigned to Jamestown (New York-Penn League). In 28 games, he batted .235, with 10 RBIs, hit three doubles, and stole one base. Blackwell opened 1971 with Greenville (Class A, Western Carolinas League) and became a full-time catcher during that season. The next year he moved to Winston-Salem (Advanced A, Carolina League). In 1973 the Red Sox promoted Blackwell to Double-A Bristol (Eastern League), where he batted .283. He tied for the league lead in double plays by a catcher with 12. Next stop on the farm club express was Boston’s Triple-A squad, the Pawtucket Red Sox (International League). At 1:00 A.M. on June 29, 1974, Blackwell got a very early morning wake-up call in Norfolk, Virginia. The 21-year-old catcher learned that the Red Sox’ Carlton Fisk had injured his knee and was out for the season. Blackwell had 12 hours to get to Cleveland for a game against the Indians. “When Pawtucket manager Joe Morgan told me about it, I was dazed,” said Blackwell. “I never thought I would be going up to Boston this soon. After all, Carlton Fisk is one of the top catchers in the major leagues.”1 In fact, Pudge, a future Hall of Famer, topped Boston in home runs and runs batted in and was second to Red Sox captain Carl Yastrzemski with a .299 batting average when a collision at home plate terminated his year. As further evidence that Blackwell had not expected such a move, the young man had paid rent through August for his apartment in Cranston, Rhode Island. With Fisk now gone and Red Sox pennant hopes in the balance, the team’s plan to fix the backstop gap was to have Blackwell alternate with veteran Bob Montgomery. So on July 3, 1974, before 27,730 in Boston’s Fenway Park, Blackwell made his major-league debut against the AL East Division rival Baltimore Orioles. He caught right-hander Reggie Cleveland. In the bottom of the third, Blackwell beat out an infield single in his first plate appearance and ended up on second base when Orioles third baseman Enos Cabell made an error. He singled again in the bottom of the fourth. In the seventh, Blackwell grounded out to second, and in the ninth he flied out to center fielder Paul Blair. The final score was Baltimore 6, Boston 4. Boston manager Darrell Johnson, a former catcher himself, said, “I knew that Blackwell had the defensive fundamentals. He catches the ball well, he throws well, makes contact. He’s never going to hit for big power, but he can hit for some average. What has impressed me most is the way he studies hitters and the game. He asks question after question. When he first got up here I might have had to task him about his calls on a couple of batters an inning. Now, it’s maybe two for an entire game. And the fact that he throws so well had kept people from running on us.”2 Blackwell closed the year with a .246 batting average, 8 RBIs, and a .971 fielding percentage. Fisk returned in 1975. As a reserve catcher with the American League pennant winners, Blackwell got into 59 games and raised his fielding percentage to match the league average of .984. Yet, he battled just .197.These totals punched him a return ticket to Rhode Island to play in the minors at the start of 1976. On April 19, 1976, Boston sold Blackwell to the Philadelphia Phillies, who sent him to their Double-A club in Reading (Eastern League). A little over a year later, on June 15, 1977, Blackwell and right-hander Wayne Twitchell were traded by the Phils to the Montreal Expos for catcher Barry Foote and southpaw Dan Warthen. At the close of the season he had swung a dismal .091 in just 17 major-league games, all but one of which came as a member of the Expos. On January 14, 1978, Montreal released him. Blackwell signed with the Chicago Cubs a month later, on February 10. The Cubs assigned him to Triple-A Wichita (American Association), where he regained form, batting, what would be for him a minor-league career high of .293 with 33 RBIs. The 25-year-old old was brought up to the parent club in July 1978. He had 103 at-bats in 49 games, hitting at a .223 pace. Indeed he was not. On June 20, 1983, Blackwell put his John Hancock on a California Angels contract. The Halos placed him at Triple-A Edmonton (Pacific Coast League) for the rest of the season. For the Edmonton Trappers, Blackwell had 192 at-bats and hit .245 with 24 RBIs. After 1983 Blackwell took up coaching as a catching instructor and minor-league manager. In 1985 he piloted the Clinton Giants (Midwest League), a San Francisco Giants Class A affiliate, to a 71-69 record. For the Mets, he steered the 1989 Pittsfield club (New York-Penn League) to the playoffs and garnered Manager of the Year hardware. In 1990 Blackwell directed the Mets’ Florida State League club, St. Lucie, to the playoffs with a 76-58 record. The following season he managed Columbia (South Atlantic League) to an 86-54 overall finish and won the playoff championship. Manager Blackwell caught the eye of the independent leagues and in 1994 Mike Veeck’s St. Paul Saints (Northern League) hired him as their field chief. The ’94 Saints were playoff champs. After two seasons in independent ball, Blackwell resumed managing in the affiliated minors, in the Baltimore, Colorado, Milwaukee, and White Sox systems. In 1995, with the Baltimore-affiliated High Desert Mavericks (California League), Blackwell’s team finished 10th with a 46-94 record. Yet in 1996 the Orioles assigned him as the skipper for the Class A Frederick Keys (Carolina League) and in the course of the season moved him up to their Double-A Bowie Baysox (Eastern League) club. In 1997 Blackwell piloted the Colorado Rockies’ Arizona League club to a 22-34 record for a sixth-place finish. The Rockies in 1998 placed him with their Double-A New Haven Ravens (Eastern League). Blackwell steered the Ravens from the circuit’s basement with a 59-83 record for a ninth-place finish. Blackwell landed in the Milwaukee chain courtesy of his old Red Sox teammate, Cecil Cooper. In 2002 Cooper, then a special assistant to the Brewers’ GM. successfully lobbied for him. Blackwell took the reins of Milwaukee’s affiliate in Odgen (Pioneer League) and brought them to the 2002 playoffs. In 2003 Blackwell managed the Brewers’ Class A affiliate, the High Desert Mavericks (California League).The club closed out the year with a 10th-place ranking and 42-98 record. Blackwell returned to independent baseball in 2006 as the pitching coach for the San Diego Surf Dawgs of the Golden Baseball League. On January 19, 2007, the league announced that Blackwell had been signed by the Chicago White Sox to manage the Class A Winston-Salem Warthogs (Carolina League) for the coming season. Blackwell directed the team to a 64-74 record which tied them for fifth place in the Carolina League. In 2008 he managed the Warthogs to a winning 71-68 record and fourth-place finish. Winston-Salem made it to the league playoffs but lost in the first round. Conversations with Cecil Cooper, June 8, 2005, Queens, New York, and John Kennedy, June 24, 2005, New Haven, Connecticut. 1 Dave Langworthy, “Tim Blackwell: He used to collect autographs, now his own is in big demand,” Christian Science Monitor, August 29, 1974, 9. 3 Joe Goddard, “Blackwell Fits In Foote Shoes,” The Sporting News, August 30, 1980, 39.